Our Farm: The Upper Farm is set on 125 rugged acres, mostly woodlot with about 20 acres of pastures, crops and clearings. We have a bucolic combination of hilly ledge, babbling brook, soothing thickets, rambling stone walls and both gravel roadway and seasonal tote roads. We have a small gravel pit, multiple wood yards, high tunnel for crops, and three sections of pasture, the furthest is about 1,000 feet from the house. Much of our back property borders conservation land. Farm Animals: We have a herd of 40 alpacas, a flock of laying hens, and we run forest-raised pigs strategically for land clearing. Carnivores Present: We have hawks, eagles and owls; raccoons, weasels, fox, coyotes, and bears. By far the predators that cause us the most concern are roaming domestic dogs. 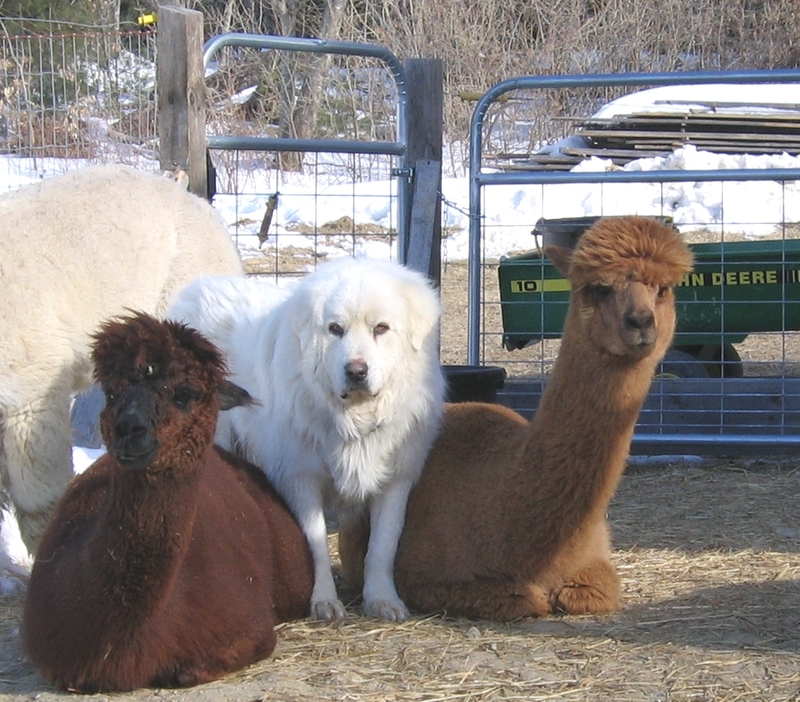 Guardian Animals: We are well protected by livestock guardian dogs, currently one for each section of pasture. We have a senior Great Pyrenees that we acquired through a New England rescue nine years ago, a senior Maremma that was rehomed to us at the age of four after looking after herds of alpacas and goats, and a young Great Pyrenees we purchased as a puppy from a local farm. The foster farm that assessed and mentored our old boy Salvador was a valuable resource after we brought him home and integrated him with our herd. The previous owner of our Maremma Sophie loves her dearly and is still in touch, as is the breeder who owns the mother of our young Pyrenees, Sarah. Fencing: We use five foot fencing, both seven-strand high-tensile and 2×4 woven wire. All of our fencing is either completely or enhanced with electricity. Some of it we installed ourselves and some of it we hired out.